Azure IoT Central brings the simplicity of SaaS for IoT with built-in support for IoT best practices and world class security and scalability with no cloud expertise required. We have been constantly adding features and true to the promise of SaaS applications, you can just start using new features right away to build production-grade applications without worrying about managing infrastructure. 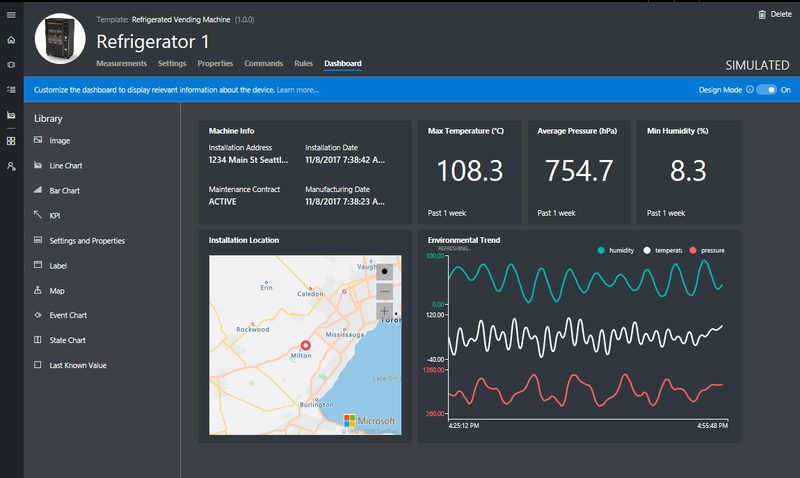 This blog post is part of a series of blog posts you will start seeing for new features in Azure IoT Central in the upcoming weeks. Azure IoT Central now leverages Azure Maps. 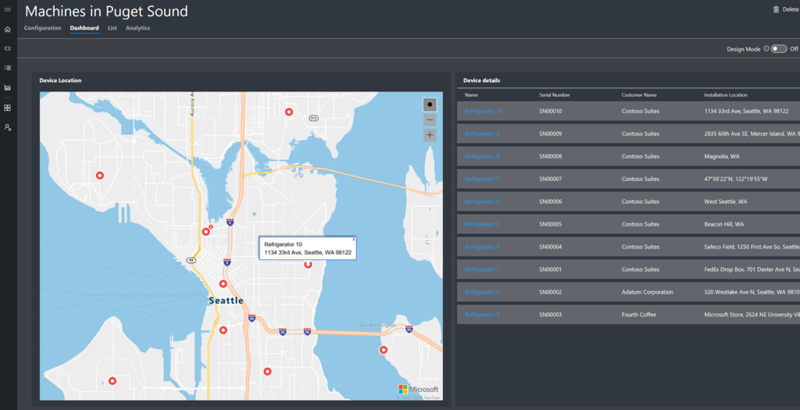 A portfolio of geospatial functionalities natively integrated into Azure to enable users with fresh mapping data necessary to provide geographic context to their location aware IoT applications. We received several interests from public preview customers to leverage geospatial services for various use cases ranging from simply localizing their devices, validating location information, spatially referencing device locations on a map, to geofencing use cases around their devices. As any other property in Azure IoT Central, location metadata can be persisted on the cloud and updated either by the device itself (device properties) or the user (application properties). By integrating with Azure Maps, user can now give geographic context to their location property and map any latitude and longitude of a street address, or simply latitude and longitude coordinates. For this first release, Azure IoT Central customers can configure a location property in their device template and pass addresses or coordinates as values. This feature uses the Azure Maps Search Service, to find addresses and places from around the world. Azure Maps supports address level geocoding in 38 regions, cascading to house numbers, street-level, and city level geocoding for other regions of the world. Similarly, Azure IoT Central users can add a location map tile in the Device Sets dashboard which will display the configured location for all the devices in the set on a map. In addition, if you are a device developer get started with the MXChip IoT DevKit device using the Azure IoT Central Sample DevKits which will contain an example of device location property and maps, all powered by Azure Maps! To explore the full set of features and capabilities, start your 30-day free trial and learn more on our website. 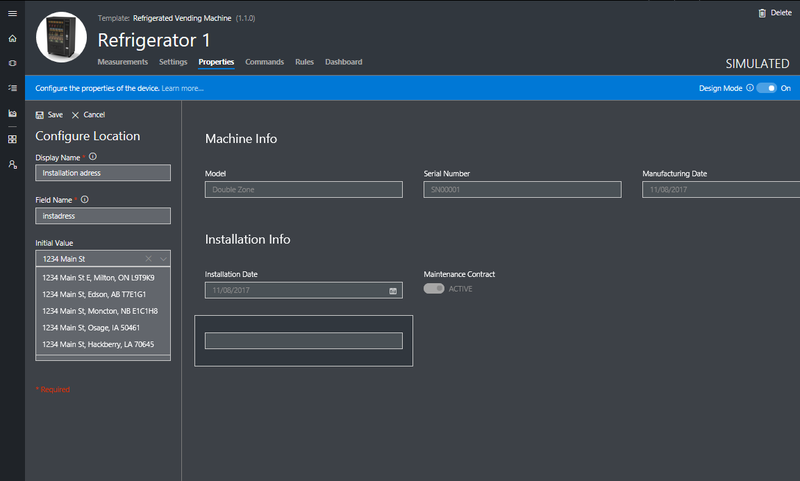 Check out our documentation including tutorials to connect your first device. Have feedback or questions? Don’t hesitate to write to us at iotcfeedback@microsoft.com. To learn more about the Azure IoT portfolio including latest news, visit the Microsoft Azure IoT page.